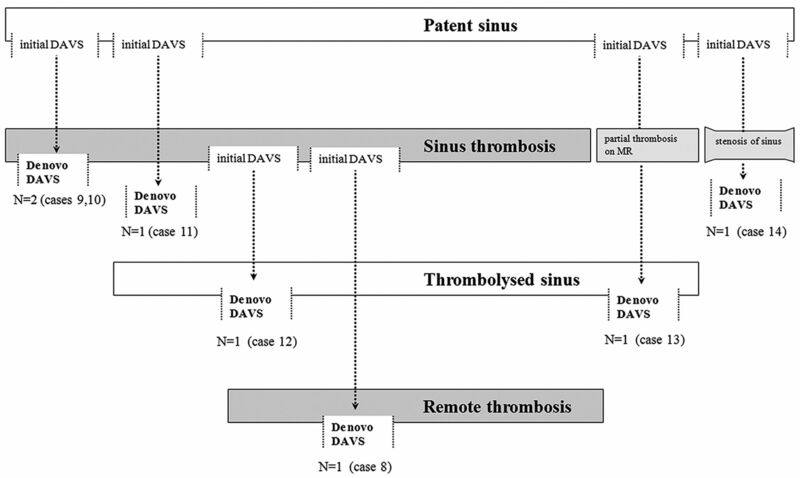 Summary of the temporal sequence of de novo metachronous DAVS development in relation to sinus thrombosis. Case 8. A, Initial left external carotid artery (ECA) lateral and left ICA anteroposterior (AP) delayed phase angiograms. Cavernous DAVS (large arrow) is seen with occlusion of the left sigmoid sinus (small arrows). Transarterial embolization of the cavernous DAVS with polyvinyl alcohol particles was performed, resulting in complete occlusion. B, The patient presented with hemorrhage 17 months later. 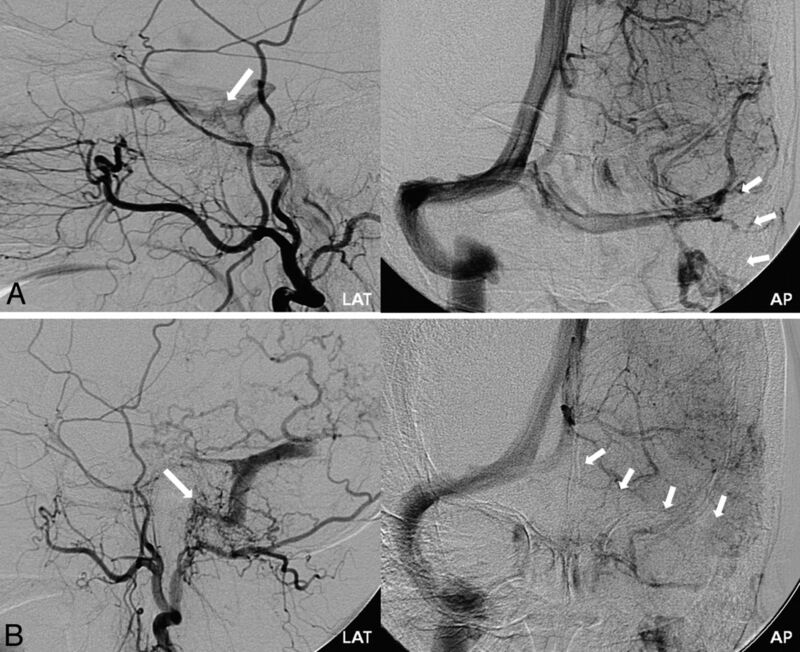 Follow-up left ECA lateral and left ICA AP delayed phase angiograms show de novo DAVS development at the previously occluded left sigmoid sinus (large arrow), with recanalization of this segment of the sinus. Upstream thrombosis of previously patent left proximal transverse sinus (small arrows) is seen, resulting in isolation of the de novo shunt. Note:—Co indicates complete occlusion; Hb, hemorrhage; IPS, inferior petrosal sinus; Po, partial occlusion; TAE, transarterial embolization; TVE, transvenous embolization. Note:—Co indicates complete occlusion; GKS, gamma knife surgery; Hb, hemorrhage; IPS, inferior petrosal sinus; Po, partial occlusion; TAE, transarterial embolization; TVE, transvenous embolization. a Intraventricular hemorrhage probably associated to partially treated lesions.